Now that the warmer weather has finally arrived, I’ve been replacing my warm protein oats with delicious protein smoothie bowls. 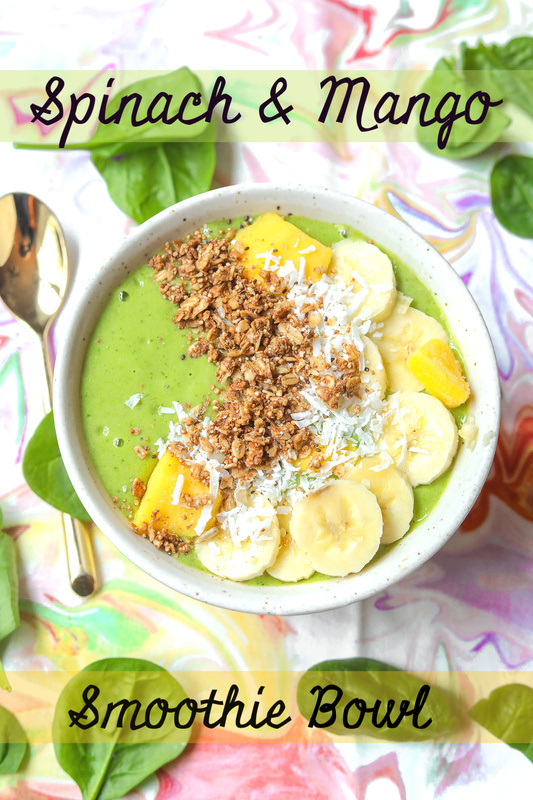 Smoothie bowls so easy and quick to make. They pack a ton of nutrients, protein, and keep me energized for my mornings. They are especially refreshing after a long walk or light run. You can customize this recipe to fit your tastebuds if you’re not a fan of some of the ingredients used. 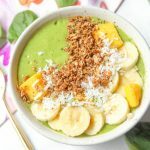 I love the simple ingredients in this recipe, and smoothie bowls are much cheaper to make at home! 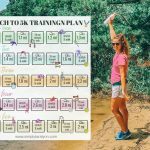 I get asked about the smoothies I drink a lot, so I’m excited to bring this guide to you! Mangos: high fiber, vitamin a & c, folate, B6, iron, and a great source of antioxidants. Almond Milk: vitamin d, e, and a healthier alternative to dairy milk. Vanilla Plant Protein Powder: low sugar, high protein, & low carb. I use RawFusion plant-based vanilla protein powder. I always add the solid ingredients first, then add the almond milk until the solid ingredients are covered, and then the protein last! Spinach is one of my favorite ingredients to add to smoothies. It blends so well, and you’re not left with the chunky greens floating around like when I use kale. Spinach also has such a light and mild flavor, so almost any ingredient can overpower it. 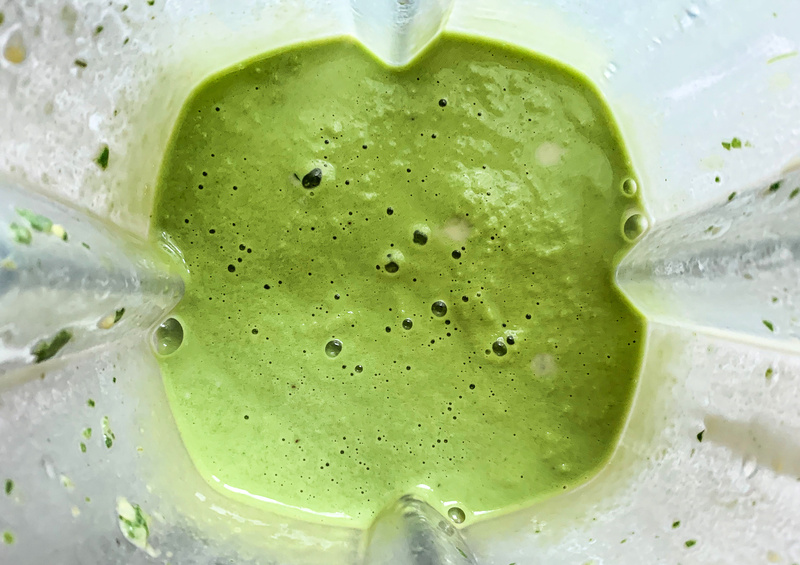 You can’t taste an ounce of the spinach, and I added about four cups to this smoothie. I love to freeze my spinach for smoothies before it goes bad or if I’m heading out of town. 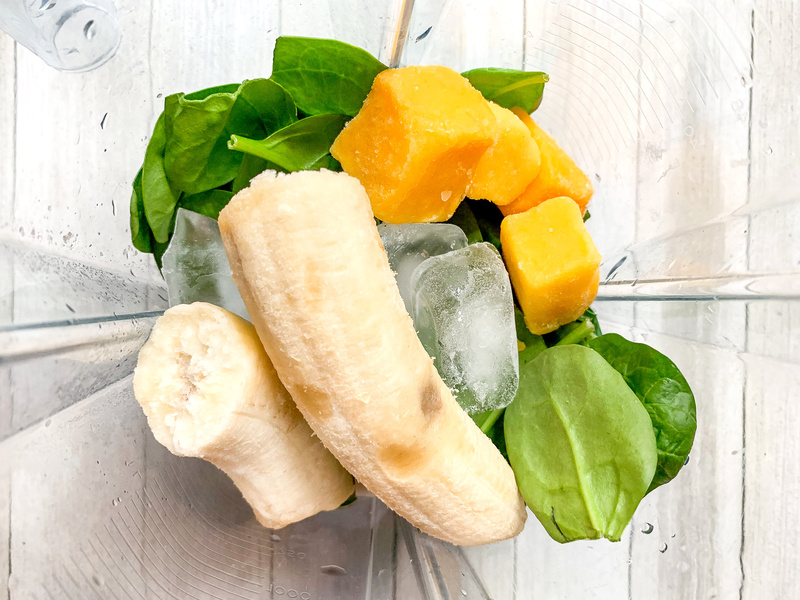 Add banana, mango, spinach, and ice cubes to the blender. Add milk and protein powder. Because this recipe has 28 grams of protein and complex carbs and sugars that come from the fruit, I think this is the best post-workout recovery option. There’s nothing worse than feeling tired all day after a workout. This meal will give you the boost you need for the rest of your day! Do you add greens to your smoothies? What is your favorite fruit to add to smoothies? Are you a smoothie or oatmeal person in the summer? 1. Not yet, but I think I’ll give it a try soon! 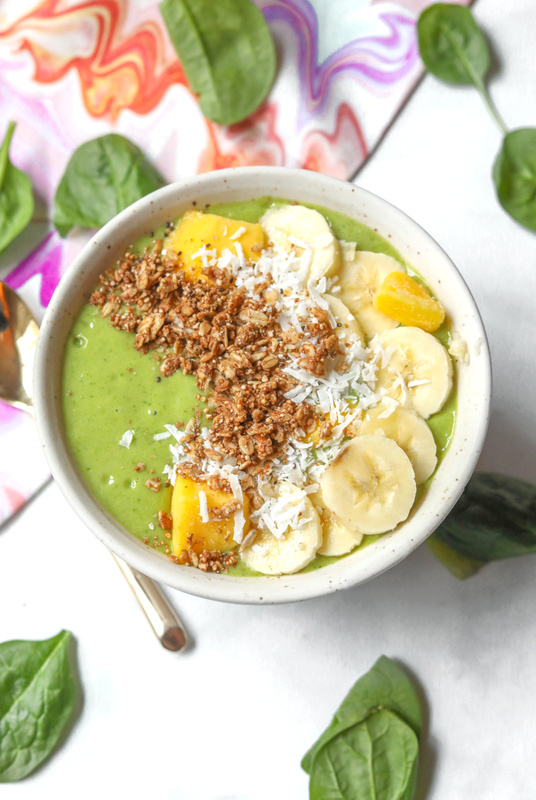 This smoothie bowl looks so yummy! 3. Definitely oatmeal, but still love a good smoothie! 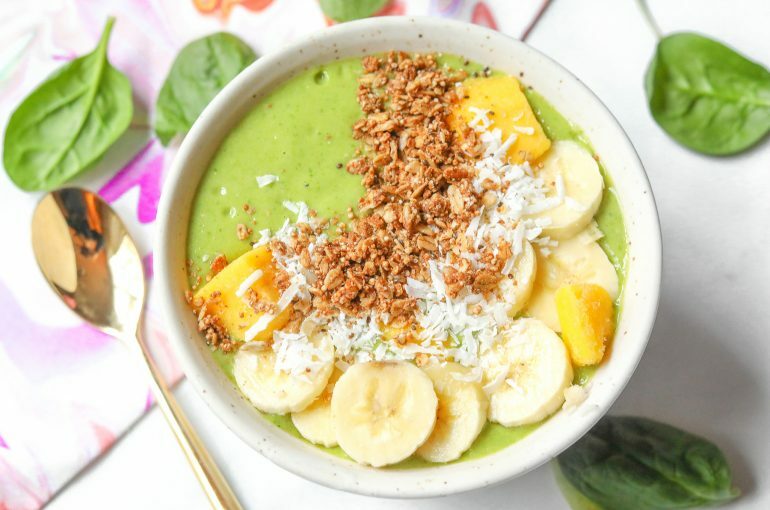 That’s such a beautiful smoothie bowl! The colors are so perfect for spring. I don’t get the chance to make smoothies that often (I’m in medical school which means early mornings, so I just tend to grab a Greek yogurt or a Quest bar in the mornings) but when I do I always add spinach or green powder! My typical smoothie contains mixed frozen berries, frozen banana, and some sort of green, and for protein I either use nonfat Greek yogurt or unsweetened almond milk with protein powder. As for toppings, I like chia seeds and cacao nibs. Smoothies are such a great way to get antioxidants in! Thank you 😃 That sounds like a delicious smoothie combo! Cocao nibs are so gooooood on top! Love adding spirulina for extra iron and protein!! mmmmmmmm those sounds so delicious in a smoothie! YUUUUMMMM! 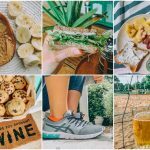 This smoothie recipe sounds so delicious & looks even more amazing in your photos!! I am obsessed with smoothies all year round. I always try to add greens to mine whether it’s spinach, kale, or green powder (from the health store). I love to mix it up with all different fruits, but one of my favorite fruit staples is a banana! I need to start using that green powder!! Do you have one you recommend? mmmm can’t go wrong with banana! On the greens powder note, I love the greens from Legion! So good. I’ve tried both the original and the acai berry! 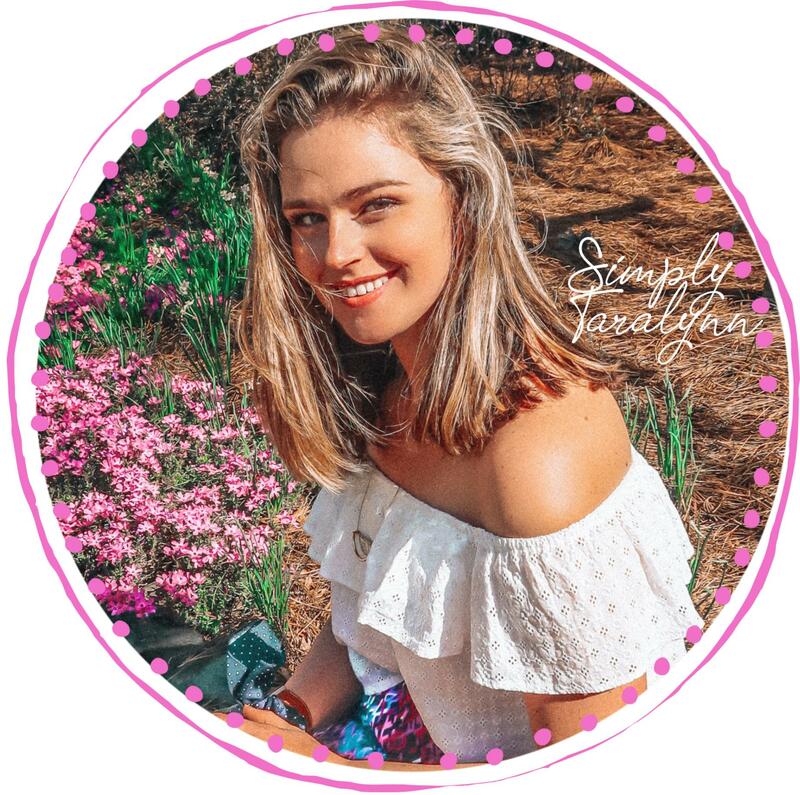 Thank you, Jessica!! Going to look into those!! I like smoothies but no matter how long I blend them for, they never get smooth like yours look. Just curious, what type of blender do you use? I use the Vitamix. You could try adding more liquids too! I try to add Greens to my smoothies and sometimes it’s avocado! Favorite fruit for smoothies is definitely banana! My fav protein shake combo is Quest chocolate protein powder, ice, water and banana – it is SO GOOD. Smoothie over oatmeal for sure. I’m so jelly of the way your smoothies turn out, mine always turn out chunky… maybe I need to add ice to them? ohhhhh yum! I bet the avocado makes it super smooth! Do you freeze your fruit? That is my little secret! THIS IS MY EXACT SMOOTHIE. Except I use Orgain typically! I use organic sometimes too! 😃 I found that raw fusion tasted the exact same but fewer carbs and cheaper!